AIMS To establish the incidence and aetiology of haemolytic uraemic syndrome (HUS) in Australia and compare clinical and microbial characteristics of sporadic and outbreak cases. METHODS National active surveillance through the Australian Paediatric Surveillance Unit with monthly case notification from paediatricians, July 1994 to June 1998. Children under 15 years presenting with microangiopathic haemolytic anaemia, thrombocytopenia, and acute renal impairment were identified. RESULTS Ninety eight cases were identified (incidence 0.64 per 105 children <15 years/annum and 1.35 per 105 children <5 years/annum). Eighty four were associated with diarrhoea (64 sporadic, 20 constituting an outbreak) and 14 were atypical. Shiga toxin producingEscherichia coli (STEC) O111:H− was the most common isolate in sporadic HUS and caused the outbreak. However O111:H− isolates from outbreak and sporadic cases differed in phage type and subtyping by DNA electrophoresis. STEC isolates from sporadic cases included O26:H−, O113:H21, O130:H11, OR:H9, O157:H−, ONT:H7, and ONT:H−. STEC O157:H7 was not isolated from any case. Only O111:H− isolates produced both Shiga toxins 1 and 2 and possessed genes encoding E coli attaching and effacing gene (intimin) and enterohemolysin. Outbreak cases had worse gastrointestinal and renal disease at presentation and more extrarenal complications. CONCLUSIONS Linking national surveillance with a specialised laboratory service allowed estimation of HUS incidence and provided information on its aetiology. In contrast to North America, Japan, and the British Isles, STEC O157:H7 is rare in Australia; however, non-O157:H7 STEC cause severe disease including outbreaks. Disease severity in outbreak cases may relate to yet unidentified virulence factors of the O111:H− strain isolated. The epidemiology of HUS in the southern hemisphere is poorly described. Although diarrhoea associated HUS occurs in Australia, STEC O157:H7 has rarely been implicated. This may reflect the fact that diagnostic laboratories do not routinely test for this STEC in patients with diarrhoea or may indicate that HUS in Australia is caused by different STEC than are commonly implicated in Europe and North America. The frequency of STEC associated disease in Australia is unknown. We undertook nationwide surveillance of HUS, as a marker of STEC related disease, through the Australian Paediatric Surveillance Unit (APSU).30 Study aims were to determine the incidence, demographic, and clinical characteristics of HUS and to examine the aetiological role of STEC. During surveillance the first major outbreak of HUS in Australia occurred,31 32 providing a unique opportunity to compare clinical, epidemiological, and microbiological characteristics of sporadic and outbreak HUS. Cases were ascertained prospectively through the APSU by active, national surveillance between July 1994 and June 1998 inclusive.30 All paediatric specialists in Australia were sent a monthly, reply paid report card and asked to indicate whether they had seen any child under 15 years of age in the previous month with any of the conditions listed on the card, including HUS. HUS was defined as “microangiopathic haemolytic anaemia (haemoglobin <100 g/l with microscopic evidence of fragmented red blood cells), thrombocytopenia (platelet count <100 000 × 109), and acute renal impairment (oliguria or anuria with increased serum urea and creatinine)”. During the study period over 900 clinicians were mailed and over 93% report cards were returned to the APSU each month. The APSU notified study investigators of reported cases of HUS each month. Investigators obtained further information on individual cases (clinical presentation, outcome, demographics, and laboratory results) from clinicians notifying cases by standardised postal questionnaire (96% of questionnaires were returned). Data provided was de-identified to maintain patient anonymity. Diarrhoea associated cases of HUS were classified as “sporadic” or “outbreak” cases. The single outbreak consisted of cases occurring in South Australia in January and February 1995 and in whom a common causative organism was subsequently confirmed. Cases with no significant gastrointestinal disease or isolation of STEC in the stool and with a family history of HUS, with an atypical or relapsing course or with confirmed systemic infection with a neuraminidase producing organism, were classified as “atypical”. The ethics committee of the Children's Hospital at Westmead, Sydney approved the study. In a 48 month period, 98 cases of HUS were identified, of which 84 (86%) were associated with gastrointestinal symptoms. Sixty four were sporadic cases and 20 comprised a single outbreak in South Australia occurring in January and February 1995.31 32 Fourteen “atypical” cases were identified, of whom five had an atypical or relapsing course, four were familial, three were associated with pneumococcal infection, one was associated with immunodeficiency, and one had an STEC associated urinary tract infection.26 The median age of cases at diagnosis was 31 months (interquartile range 16–70 months) and 70/98 (71%) children were under 5 years of age. Ninety one (92%) children were hospitalised for a median (interquartile range) of 14 (7–21) days. The reported annual incidence of HUS (with 95% CI) was 0.64 (0.52 to 0.78) per 105 children under 15 years. Incidence was significantly higher in children under 5 years (1.35 (1.06 to 1.72) per 105) than in those aged 5–14 years (0.28 (0.18 to 0.39) per 105; Fisher's exact test, p < 0.0001). When outbreak cases were excluded from the analysis, the overall incidence was slightly, though not significantly lower. Figure 1 shows the distribution of cases by type and month of presentation. During the entire study period there was a significantly higher incidence of cases during summer months (χ2 test for trend, p < 0.001). This seasonal distribution persisted when outbreak and atypical cases were excluded. However, when the data were analysed by individual year of occurrence, a significant increase in sporadic cases in the summer only occurred in 1994–95, at the time of the outbreak. All sporadic cases occurring during this time period were microbiologically distinct from outbreak cases. There was a significant trend in the incidence of sporadic HUS, which decreased over the four year study period (χ2 test for trend, p < 0.001). During the entire study period none of the sporadic cases was associated with another sporadic case. Seasonal distribution of HUS cases by type: July 1994 to June 1998 (n = 98). Incidence of sporadic HUS decreased significantly over the study period (p < 0.001; Cochran–Armitage trend). Overall a seasonal (summer) peak in incidence was seen (p < 0.001). Table 1 shows laboratory and clinical features of children with diarrhoea associated HUS. The outbreak group was significantly older than the sporadic group and the proportion of children under 5 years was lower. There was no gender bias. Duration of hospitalisation was significantly longer in the outbreak group. The minimum haemoglobin and maximum neutrophil counts were not significantly different between groups (table 1). Maximum serum creatinine was significantly higher in the outbreak group and minimum platelet count and minimum serum sodium concentrations were significantly lower in the outbreak group. Eighty per cent of outbreak and 48% of sporadic cases developed anuria; its duration was significantly longer in the outbreak group (table 1). Significantly more outbreak cases required dialysis and the duration of dialysis was significantly longer in the outbreak group. The frequency of acute hypertension in groups did not differ. However, at discharge from hospital a significantly greater proportion of the outbreak group had persistent renal impairment (increased serum creatinine) and hypertension requiring treatment (table 1). Although a diarrhoea prodrome was present in all 84 children, outbreak cases had a shorter prodrome and a much higher rate of macroscopic bloody diarrhoea (table 1). In outbreak cases the diarrhoea prodrome lasted between one and seven days and in sporadic cases, one to 30 days. Significantly more outbreak cases had severe haemorrhagic colitis. Left hemicolectomy was required in one outbreak case with ischaemic colon and partial colectomy in another. One sporadic case required appendicectomy and omentectomy. Vomiting was reported in around 80% of both groups. Acute pancreatitis occurred in one outbreak case and hyperglycaemia was significantly more frequent in the outbreak group (table 1). Insulin was required in two outbreak cases and one sporadic case. The proportion of children with central nervous system complications (intracranial bleed or infarct, retinal haemorrhage, encephalopathy, seizure) was higher in the outbreak group. One sporadic case had anterior compartment syndrome caused by rhabdomyolysis and required fasciotomy of the right leg. An iliac vein thrombosis occurred in one child in the outbreak group. Three of 84 patients died (table 1). A 4 year old girl with outbreak HUS and acute renal failure, multiple cerebral haemorrhagic infarcts, and extensive colonic necrosis died two days after diagnosis. A 10 year old boy with sporadic HUS and STEC O111 in the stool died eight days after diagnosis, from cardiac complications (myocarditis with pericardial effusion and tamponade). A 1 year old boy with sporadic HUS died within 12 months of diagnosis with persistent hypertension and renal failure. Twelve month follow up data were available on all 19 survivors of the outbreak and 43 of 62 survivors of sporadic HUS. Six of 19 outbreak cases and four of 43 sporadic cases had chronic renal failure (persistent elevation of creatinine and/or glomerular filtration rate of <80 ml/min/1.73 m2) at follow up (p = 0.06). Hypertension persisted at 12 months in four sporadic but no outbreak cases. No survivors of the outbreak developed end stage renal failure, defined as requiring chronic dialysis (whether or not awaiting transplantation) or having had renal transplantation. Of the three sporadic cases that developed end stage renal failure by 12 months after diagnosis, one had had a kidney transplant, one was awaiting transplantation, and one had died. One sporadic case had persistent insulin dependent diabetes mellitus. Five children with sporadic HUS had seizures at follow up. Three of these developed seizures following discharge from hospital, so their aetiological relation to HUS is unclear. Stool and/or serum samples were available from all outbreak cases. STEC serotype O111:H− was isolated from 16/20 stools from these children.23 Stool specimens or bacterial cultures were investigated from 50/64 children with sporadic HUS. STEC were isolated from 20/50 specimens (table 2). These included strains of serotypes O111:H−, O26:H−, O113:H21, O130:H11, O157:H−, O non-typeable:H−, O non-typeable:H7, and O rough (R):H9. All isolates fermented sorbitol except those of serogroup O157 (table 2). One child was infected with both STEC OR:H9 and an Stx2 producing strain ofEnterobacter cloacae. 38 STEC O111:H− was also isolated from the stool of the asymptomatic identical twin brother of a culture negative case of endemic HUS.39 The high number (30/50) of negative stool cultures in sporadic cases is not surprising in view of the long diarrhoea prodrome (up to 30 days) prior to diagnosis of some cases in this group. 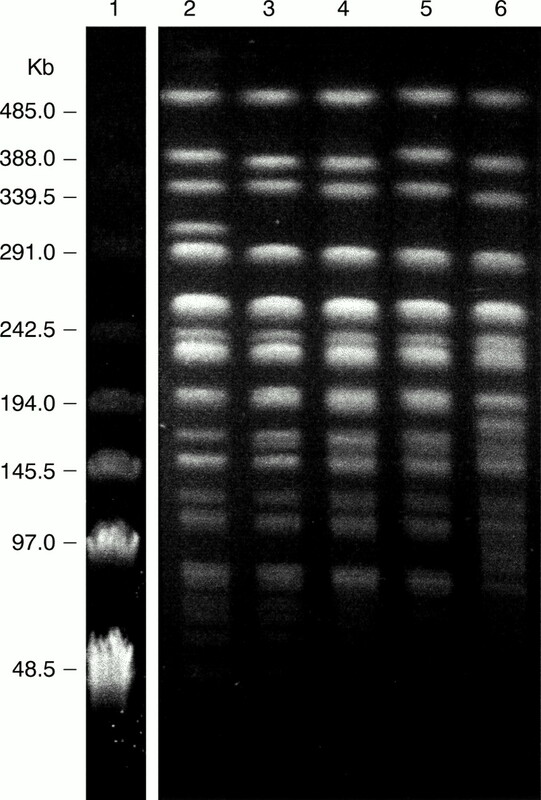 Composite image of PFGE of whole cell DNA from serogroup O111 isolates of E coli digested with XbaI. Lane 1, PFGE marker I (Boehringer Mannheim); lane 2, outbreak case; lanes 3–7, sporadic cases. Molecular weights of the markers are indicated on the left. Serum was available from 30 children with sporadic HUS, but as only one serum sample was available from most cases, we selected a high agglutinating antibody titre (>1/640) to indicate recent infection with E colistrains of serogroups O26, O111, or O157. Five patients showed increased antibody to O157, one of whom was also culture positive for STEC O157:H−. All 25 other sera investigated for antibodies to serogroup O157 showed a titre of <1/80. Three patients who were culture positive for STEC O111: H−, had an antibody titre to O111 of >1/640. The other five O111 culture positive patients identified in this study did not undergo serological examination. One patient with negative stool culture had a titre of >1/2560 to O111. No patient showed increased antibody titres to O26. The epidemiology of HUS in Australia has not been described previously. Four years of national surveillance through the APSU identified 98 patients under 15 years of age with HUS. Approximately 90% had diarrhoea associated HUS and 20 were affected during an outbreak of STEC O111:H− transmitted by contaminated mettwurst. Diarrhoea associated HUS was associated with at least eight different STEC serotypes. Although up to seven cases were associated with STEC O157, no strains of O157:H7 were isolated, indicating major geographical differences in strain prevalence worldwide. Comparison of clinical features of sporadic and outbreak cases of HUS suggests the outbreak strain caused more severe disease at presentation, although specific microbial factors accounting for these differences were not identified. Previous studies suggest a summer peak of STEC infection and HUS.8 Overall our study showed a seasonal (summer) peak in incidence. However, when analysed by individual year, a summer peak in sporadic HUS occurred only in the year of the outbreak. Interestingly, this increase was Australia wide and not restricted to the area of the outbreak. Further, the outbreak cases occurring at this time were microbiologically distinct from sporadic cases. This suggests that climatic or environmental factors operating throughout the country may have contributed to a high background incidence of STEC infection during this period, caused by a variety of STEC, and also increased the risk of an outbreak. Microbial factors are likely to be important determinants of disease severity. In HUS, Stx is responsible for microvascular injury causing bloody diarrhoea and the systemic manifestations.7 29 The extent of damage may relate to the amount of toxin absorbed, toxin type (Stx1 or Stx2) or subtype, and/or unrecognised host susceptibility factors.7 Expression of the eaegene is required for bacterial production of intimin, an outer membrane protein involved in the attachment of the STEC to epithelial cells.7 STEC frequently produce enterohemolysin but the roles of this and other plasmid encoded factors in disease are unknown.44 The O111:H− strains, which caused the outbreak and those found to be associated with sporadic HUS, exhibited all the pathogenicity traits described above. However, comparison of outbreak O111:H− isolates with several O111:H− isolates from sporadic cases revealed differences in phage type and DNA restriction fragment length polymorphism, indicating that different O111:H− strains were responsible for outbreak and sporadic HUS. Genetic differences in the outbreak strain may contribute to differences in virulence by virtue of the presence of currently unknown virulence determinants or of different quantities of known determinants. A recent Minnesota study reported that molecular subtyping of strains isolated from the local community allowed the authors to identify mini outbreaks which would not have been recognised with standard microbial characterisation.40 Molecular subtyping is also useful for O111 STEC and may provide a mechanism to identify strains with different degrees of virulence. In this study, several non-O157:H7 strains were identified in children with HUS, as previously recognised.18 21 22 25 Apart from O111, only one of these produced both Stx1 and Stx2. Three strains lacked the eae gene and two of these were negative for enterohemolysin. The aetiological role of such strains in HUS is open to question, given that Stx1 and Stx2 are encoded by somewhat promiscuous bacteriophages which are readily transmitted between different strains of E coli. 45 Thus, the ability to produce Stx may be acquired by a relatively harmless E coliresident in the intestinal tract from a virulent STEC strain that was not detected when the stool sample was taken.45 In such cases serological investigation may shed light on the aetiological agent by permitting detection of antibodies to O antigens associated with the most frequent STEC O serogroups. This applied to four patients in this study who were culture negative, but displayed increased antibody titres to O157. Detection of antibodies to Stx1 and Stx2,46 as well as to intimin or functionally related, chromosomally encoded proteins,47enterohemolysin,48 and flagella antigens may also provide useful retrospective information about the causative organism in culture negative patients. In this study, the relatively low isolation rate (40%) of STEC overall and of O157 strains in particular, from children with sporadic HUS may have been a result of an undue delay in obtaining samples for culture and transporting them to the laboratory. Isolation rates of O157 strains could conceivably have been improved by selective enrichment, for example, by using immunomagnetic enrichment of faecal samples. Such strategies, however, would probably have biased the data against non-O157 strains. Medium term prognosis for diarrhoea associated HUS in this study was similar to that reported previously.4 5 Despite differences in disease severity at presentation, follow up at 12 months indicated no significant differences between outbreak and sporadic groups in rates of chronic renal failure and end stage renal failure. Mortality rates and prevalence of hypertension, central nervous, and gastrointestinal complications in groups were also similar. In conclusion, nationwide HUS surveillance through APSU, which is ongoing, provided new information on the burden of HUS in Australia and enabled linkage of epidemiological, clinical, and microbiological data. We identified 12 non-O157:H7 strains of STEC associated with HUS including one O111:H−, which was responsible for an outbreak. The heterogeneity of isolates and the absence of O157:H7 differ from the current situation in most countries. The observation that O157 isolates were non-motile and failed to produce the full array of virulence associated determinants suggests a comparatively reduced virulence of Australian representatives of this serogroup and may explain their failure to become established in this country. This study was unique in allowing comparison of outbreak and sporadic diarrhoea associated HUS occurring during surveillance and indicates that outbreak cases had more severe disease at presentation. Examination of microbial pathogenicity factors of isolated strains supported the notion that the outbreak of HUS may have been associated with a more virulent strain of STEC than strains causing sporadic disease. We acknowledge all Australian paediatricians who contribute to the APSU, and the support of the Australian and New Zealand Paediatric Nephrology Association and the Division of Paediatrics of the Royal Australasian College of Physicians. We thank the following clinicians, who provided clinical information on cases reported to this study: Drs Anderson, Andrews, Brown, Burke, Choong, Craig, Donnelly, Duncan, Ebeling, Ferson, Fiumara, Forrest, Ford, Frischman, Goldwater, Gadd, Gorton, Gray, Harris, Harding, Henning, Hewitt, Hill, Hodson, Hogg, Hu, Jaensch, James, Jaquiery, Jenkins, Jureidini, Jones, Kelso, Kainer, Ketteridge, Knight, Lammi, Lewis, Lines, Lennon, McEniery, McLennan, Mulcahy, Munt, Num, O'Loughlin, Pearson, Powell, Prebble, Pallas, Petek, Rice, Roper, Ruben, Rosenberg, Roy, Shelton, Smith, Stuart, Sparnon, Taylor, Thesinger, Thies, Thomas, Tonge, Westphalen, White, and Wheaton. Laboratory assistance was provided by A Bigham, K Bettelheim, and D Lightfoot in Melbourne, and J Paton and P Goldwater in Adelaide. The APSU was funded by the Financial Markets Foundation for Children, the Commonwealth Department of Health and Aged Care, and the Clive and Vera Ramaciotti Foundation (administered by Perpetual Trustees). Laboratory studies were supported by the National Health and Medical Research Council of Australia. (1983) Sporadic cases of haemolytic-uraemic syndrome associated with faecal cytotoxin and cytotoxin-producing Escherichia coli in stools. Lancet 1:619–620. (1985) The association between idiopathic hemolytic uremic syndrome and infection by verotoxin-producing Escherichia coli. J Infect Dis 151:775–782. (1991) Epidemiology of hemolytic-uremic syndrome in Canadian children from 1986–1988. The Canadian pediatric kidney disease reference centre. J Pediatr 119:218–224. (1990) Haemolytic uraemic syndromes in the British Isles 1985–8: association with verotoxin producing Escherichia coli. Part 1: clinical and epidemiological aspects. Arch Dis Child 65:716–721. (1994) Escherichia coli O157:H7-associated hemolytic-uremic syndrome after ingestion of contaminated hamburgers. J Pediatr 125:519–526. (1990) The epidemiology and clinical aspects of the hemolytic uremic syndrome in Minnesota. N Engl J Med 323:1161–1167. (1998) Pathogenesis and diagnosis of Shiga toxin-producing Escherichia coli infections. Clin Microbiol Rev 11:450–479. (1995) Escherichia coli O157:H7 and the hemolytic-uremic syndrome. N Engl J Med 333:364–368. (1983) Hemorrhagic colitis associated with a rare Escherichia coli serotype. N Engl J Med 308:681–685. (1990) Hemolytic-uremic syndrome during an outbreak of Escherichia coli O157:H7 infections in institutions for mentally retarded persons: clinical and epidemiologic observations. J Pediatr 116:544–551. (1996) Outbreak of Escherichia coli O157:H7 infections associated with drinking unpasteurized commercial apple juice—British Columbia, California, Colorado and Washington, October 1996. JAMA 276:1865. (1987) A severe outbreak of Escherichia coli O157:H7-associated hemorrhagic colitis in a nursing home. N Engl J Med 317:1496–1500. (1992) A waterborne outbreak in Missouri of Escherichia coli 0157:H7 associated with bloody diarrhea and death. Ann Intern Med 117:812–819. (1994) A swimming-associated outbreak of hemorrhagic colitis caused by Escherichia coli O157:H7 and Shigella sonnei. N Engl J Med 331:579–584. (1996) Cluster of haemolytic uraemic syndrome due to unpasteurised cheese. Pediatr Nephrol 10:203–205. (1995) Escherichia coli O157: outbreak in a day nursery. CDR (Lond Engl Rev) 5:R4–R6. (1996) Growing concerns and recent outbreaks involving non-O157:H7 serotypes of verotoxigenic Escherichia coli. J Food Prot 59:1112–1122. (1993) Shiga-like toxin-producing Escherichia coli in Seattle children: a prospective study. Gastroenterology 105:1724–1731. (1997) Unusual verotoxin-producing Escherichia coli associated with hemorrhagic colitis. J Clin Microbiol 25:1486–1489. (1996) Diarrhea in young children associated with Escherichia coli non-0157 organisms that produce shiga-like toxin. J Pediatr 128:341–346. (1998) Shiga-toxin producing Escherichia coli in Australia. in Escherichia coli O157:H7 and other Shiga toxin-producing E. coli strains. eds Kaper JB, O'Brien AD (American Society for Microbiology, Washington, DC), pp 66–72. (1996) Molecular microbiological investigation of an outbreak of hemolytic-uremic syndrome caused by dry fermented sausage contaminated with shiga-like toxin-producing Escherichia coli. J Clin Microbiol 34:1622–1627. (1993) Prevalence of verotoxigenic Escherichia coli serogroup 0157:H7 in children with diarrhoea attending a Sydney hospital. J Paediatr Child Health 29:185–187. (1990) Haemolytic uraemic syndrome in the British Isles 1985–8: association with Escherichia coli. Part 2: microbiological aspects. Arch Dis Child 65:722–727. (1998) Hemolytic-uremic syndrome following urinary tract infection with enterohemorrhagic Escherichia coli: case report and review. Clin Infect Dis 27:310–315. (1998) Hemolytic uremic syndrome associated with invasive Streptococcus pneumoniae infection. Pediatrics 101:699–703. (1993) Atypical (non-diarrhea-associated) hemolytic-uremic syndrome in childhood. J Pediatr 122:532–537. (1994) Haemolytic-uraemic syndrome in practice. Lancet 343:398–401. (1997) Communicable diseases and the Australian Paediatric Surveillance Unit. CDR (Lond Engl Rev) 7:R14–R16. (1998) Haemolytic-uraemic syndrome outbreak caused by Escherichia coli O111:H-: clinical outcomes. Med J Aust 168:552–555. (1995) Enterohaemorrhagic Escherichia coli outbreak in South Australia associated with the consumption of mettwurst. Commun Dis Intell 19:70–71. (1993) Examination of archetypal strains of enteropathogenic Escherichia coli for properties associated with bacterial virulence. J Med Microbiol 38:222–226. (1987) New method of serotyping Escherichia coli: implementation and verification. J Clin Microbiol 25:781–786. (1995) Interpreting chromosomal DNA restriction patterns produced by pulsed-field gel elctrophoresis: criteria for bacterial strain typing. J Clin Microbiol 33:2233–2239. (1992) Immunologic methods for the diagnosis of infections by Enterobacteriaceae and Vibrionaceae. in Manual of clinical laboratory immunology, eds Rose NR, de Macario EC, Fahey JL, et al. (American Society for Microbiology, Washington, DC), 4th edn. pp 482–488. (1995) Further analysis of categorical data. Statistical methods in medical research (Blackwell Science, Oxford), 3rd edn. pp 410–411. (1996) Enterobacter cloacae producing a Shiga-like toxin II-related cytotoxin associated with a case of hemolytic-uremic syndrome. J Clin Microbiol 34:463–465. (1996) Haemolytic-uraemic syndrome in the Hunter: public health implications. Aust N Z J Public Health 20:457–462. (1997) Surveillance for Escherichia coli O157:H7 infections in Minnesota by molecular subtyping. N Engl J Med 337:388–394. (1998) Recent outbreaks of infection caused by Escherichia coli O157:H7 in Japan. in E. coli O157:H7 and other Shiga toxin-producing E. coli strains. eds Kaper JB, O'Brien AD (American Society for Microbiology, Washington, DC), pp 73–81. (1992) Association between severity of gastrointestinal prodrome and long-term prognosis in classic hemolytic-uremic syndrome. J Pediatr 120:210–215. (1997) Predictors of hemolytic uremic syndrome in children during a large outbreak of Escherichia coli O157:H7 infections. Pediatrics 100:12. (1998) The complete DNA sequence and analysis of the large virulence plasmid of Escherichia coli O157:H7. Nucleic Acids Res 26:4196–4204. (1998) In vivo transduction with Shiga toxin 1-encoding phage. Infect Immun 66:4496–4498. (1998) Human immune response and immunity to Shiga toxin (Verocytotoxin)-producing Escherichia coli infection. in Escherichia coli O157:H7 and other Shiga toxin-producing E. coli strains. eds Kaper JB, O'Brien AD (American Society for Microbiology Press, Washington, DC), pp 236–248. (1996) Secretion of extracellular proteins by enterohemorrhagic Escherichia coli via a putative type III secretion system. Infect Immun 64:4826–4829. (1995) Molecular analysis of the plasmid-encoded hemolysin of Escherichia coli O157:H7 strain EDL 933. Infect Immun 63:1055–1061.